Submitted by jwpierce on November 7, 2007 - 7:52pm. Hey all, I'm looking to get into this and was wondering if anyone is in Canada and where. Also, are there any respected training facilities in the great white north? Any locals in Kamloops willing to fly somewhere this week ? Heading out to kanaskis tomorrow for some speed riding, hopefully vis is good! Anyone based out of Calgary? I'm flying down to the states for training, wing just arrived, looking to do some speedriding when I get back at the end of January (earn your turns type deal), and carry it over for some hike and flies in the summer. I can't find much local information so my buddy and I are just going to wing it (pun intended). I've been mapping potential flights on google earth all week, mostly in the front ranges and foothills to start. I assume the rockies are about as ideal for speedflying as they are for back country skiing (highly variable conditions, and often dangerous). If any locals want to reach out with some beta it would be much appreciated! I've pretty much read everything I can find online, even in the youtube comments. Pursuant to section 7(1) of the National Park General Regulations, the takeoff or landing of either non-motorized paragliders or hang-gliders is PROHIBITED by order of the Superintendent. WHERE: The entirety of Banff National Park. WHY: To protect wildlife and habitat pending identification of suitable takeoff and landing zones for non-motorized paragliding and hang-gliding. Violators will be charged under the National Park Regulations; maximum fine $25,000. My name is Justin H, I am living in Banff for the winter, maybe longer. I work at sunshine as a ski instructor. I am looking to get into speed-riding, I am a cert skydiver and wish to lear this new sport. I hear there is a community in Canmore that is into speed-riding. Here is a little edit from flying Greely Bowl at Revelstoke. Anyone else flown the N Face of Mac peak? I'm immigrating to Canada soon, what's the verdict on best speedflying/ riding area? better to go somewhere with sick sled accessed terrain? or any particular resort towns for lift accessed backcountry/ offpiste and less trees? many roads up hills in Canada? or gondolas/ airtrams? how are the ski field access roads for summer speedflying? Revelstoke/ Banff/ Canmore sounds good? but what about the coastal mountains? Im from Vancouver BC and am extremly interested in learning the basics of controling a speedflying kite. Im ready to pay a good amount of money to some who can teach me how to get from skiing to the air and back down again. Im purchasing a new Niviuk skate 10 or 12 M kite. I will bring everything needed to fly and you will bring your knowledge. WILL PAY YOU GOOD SUM!!!!! Yes, I do need to train prior to hit a big mountain. I'm still on the lookout for a trainer hill near Revelstoke but since I am pretty new in town it's still hard to find. I never skydived or paraglide (only tandem with a bit of control but very basic things). I am a snowboarder that got hooked to this sport the first time I saw someone doing it. It was like a revelation, almost a tailer made sport for me and my tastes. Got the wing and touring skis and are very motivated to get going into this sport. This is however a long term project, as I do not absolutely want to fly this winter. I'll have plenty of time once back home in Quebec in July to go try it out and get a para training at Mt Sainte Anne. Hey Jason, have you ever skydived before?? I am not sure if you are a jumper learning to speedfly or trying to learn to speedfly before skydiving or paragliding. Either way, a few of us are around and would be happy to teach but if you have no flight experience then I would say that it would be better for you to learn to launch and land on a trainer hill before hitting up the big mountains. Well as far as actually trying out the RMR resort, this I haven't done yet. I'm still re-learning to ski after a 15 yr pause (i'm a boarder). This is the easy part. I've done a couple of groundhandling sessions on the local soccer terrain by the river and i've been trying to foot launch this afternoon from the top of the Nels Nelsen ski jump hill. Unfortunately, the snow was deep and very 'sticky' so i was not able to run as far as I would have liked and that resulted in failed launches (but i nearly got it...) but I had a lot of fun trying it anyway ! Since RMR will now only tolerate flying tree top level, I may be forced to wait later, maybe even for an upcoming season as I doubt I would be able to handle this from top to bottom without problems and I would rather stay off than getting stuck in a tree or injuring myself and getting a bad record for speedriders here. Anyway, my goal is not to do speedriding 'this' winter. I am not in a hurry to die so I will take all the necessary step to avoid it, even if I need to wait a few months to get better at it. I either need to take an intro course to paragliding or to get along with someone willing to show me the basics from where I can work my way up to full control of the wing. That is good news, I will try to make it out to RMR towards the end of the season, maybe even bring some of the other speedflyers from calgary along for some fun!! Just wondering how you are doing with the speed flying? Chris and I were out flying on Monday and Tuesday. Conditions were perfect. Give me a call at 250 837-1202 if you want to get out to RMR for a flight. On that note, to all other riders, the ski patrol have had a few words with speed riders this year and had a little chat with us too on Tuesday. The resort is still tolerant of our fun but have restricted us to keep it up at tree top level. Please contact me at the above number if you plan a trip to RMR. Do you guys know of any speedflying opportunities on Vancouver Island? I am a total beginner but have kiteboarder for 6 years and assume the controls are somewhat familiar. (Don't worry, I hope to find someone here to teach me - not gonna just jump on and assume I can learn myself). Thanks Ram air man ! I'm going out today to look for such a place! Hi, I'm new in Revelstoke and i am looking for a spot to practice handling my wing prior to go out trying speedriding. Does anybody here can 'hint' me to where i should look. I can drive out of town if necessary, for example Golden but my main goal is to start speedriding so not to learn all the paragliding stuff that won't serve me (for example thermals). I would also be willing to take a begginer training so i can fly my wing in a safe way. hey any one know where to buy used gear i am looking for a different canopy to launch i use my xaos 84 now but i want a gl canopy instead so i can do some foot launches not just skis. and who is ripping it up on the west coast?? it is going to be a killer season!!! Revy ski hill encourages paragliders but they aren't too fond of speedriding. Overall they looked the other way when I was doing it but I was careful to stay way high when there were skiers on the runs. Weekdays were pretty quiet and then I could crank and ski down the runs. I might be doing tandem paragliding flights there again this year. My buddy Chris, who lives there, is buying a Bobcat and is pretty stoked to get riding. Overall, I can give you more details and site information when you are there or send me an email at adventures(at)heliparagliding.com . Yes, as it turns out there are several "runs" in Alberta around Canmore and Kananaskis country... most of which are old hike and fly sites used by paragliders.... the thing is that most people don't know about these places since nobody really flies them anymore. In that movie, the first flight was off of Chinamen's Peak outside of Canmore and the second is off of Mt. Yamnuska, there are at least 5 more mountains that can be flown in that area... all of which are old PG sites that nobody uses anymore. I'm guessing that you mean Kickinghorse Mountain Resort. They have not given any official approvals to fly there although they are 'thinking' about it. They have changed from yes to no several times over their ten years of existence. There is likely also a lot of red tape if you want to launch from their property. We did a speed riding flight from there this winter but we launched from out-of-bounds. They were not completely opposed to it. They don't have a designated launch site. If you are asking about the 'para-glide launch point' on Mt. 7 then there is no problem flying from there. Of course the official stance is that you must a member of the HPAC to use that site and the designated landing area. But the best flights are from the peak of Mt. 7 where we were early this morning. The cliff faces and valleys down from there are pretty amazing. You are welcome to join us anytime. It's a bit of a hike though. We have other locations that we plan to explore soon but they also involve some hiking. Although we did fly the paragliders up a time or two with the speed wings on our backs, landed on the peak, then flew the speed wings down. I'm sorry that I cannot find how to send a PM. Please send me an email to the previously mentioned address above. No I haven't been to Kananaskis to fly. We stay pretty close to Mt. 7 most of the time. If you are coming to Golden send me an email. We are usually going early in the am before work. Scott, have you been out to Kananaskis coutry yet? I've heard of a few people speedflying out there as well. Send me a message next time you plan on heading out and I will join you. We have been doing plenty of speed flying runs from the top of Mt. 7. There are two steep, rocky canyons down the west face. 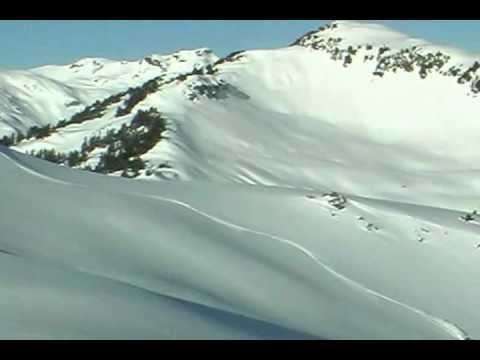 Plus a lot of speedriding at Revelstoke Mountain Resort this past winter. One run at KHMR too. I've heard about a few flights being done at Whistler. Submitted by ram_air_man on February 12, 2009 - 4:42am. where did you go?? valemont?? I've found videos on youtube of guys speedflying at golden off of mount seven. myself, I haven't had the time to organize a trip yet, planning on trying mcbride peak in the summer. Submitted by mjkoziel on January 26, 2009 - 5:09pm. Hey guys, speedflying/groundlaunching in BC/Alta is everywhere. Just got home from a 2000ft alpine first descent! Submitted by ram_air_man on January 13, 2009 - 8:07am. We don't have the mountains for speedflying but we do have lots of ridges and coulees, once the deep freeze lifts I will try some ridge soaring with the bobcat. I always thought that a guy could get away with some speedflying in the Willmore Wilderness park, just hike and fly in the summer time. I've also heard of some guys using ski hills for practice. Maybe we should see where the skydivers do some ground launching??? Submitted by KennC on January 27, 2008 - 5:42pm. Hi John, I'm from Alberta and recently got the bug for this as well. I skydive close to Calgary and met one fellow from BC who does bit of speedflying out there, he was showing me some of his videos, other than him I don't of anyone doing this here?? We don't have the terrain like they do elsewhere but there are some decent enough hills close by to get some short runs in. That's why I was glad to find this website.